What better way to get more exercise and get lots of fresh veg into my diet, than to create my very own “Victory Garden”! At the house I am renting here in Nottingham, I’ve only just started growing a few vegetables, fruits and herbs in pots. My garden has a small lawn and I’m not sure whether the landlord would be too happy if I changed that into a wartime vegetable garden just yet, so instead I’m starting to clear a very overgrown area at the back of the garden, to re-create a small Victory Garden, and eventually supply our kitchen with most of the vegetables used in wartime recipes of the 1940’s.. I got quite excited this afternoon as I started to clear mounds of tall, thick weeds from the bottom right area of the garden, and came across a semi paved flat area which will be ideal for a small greenhouse. I can’t afford a proper greenhouse yet (although I’m keeping my eyes peeled on Freecycle) so I purchased a small walk-in poly greenhouse from Argos for 25 quid which I think will be very useful indeed. The area I’m clearing appears to be part paved and flat so ideal for my little poly greenhouse! So lots of clearing work to do, I’m not quite sure where to put all the debris, as I no longer have acres of land to dispose of branches and thorny bushes! 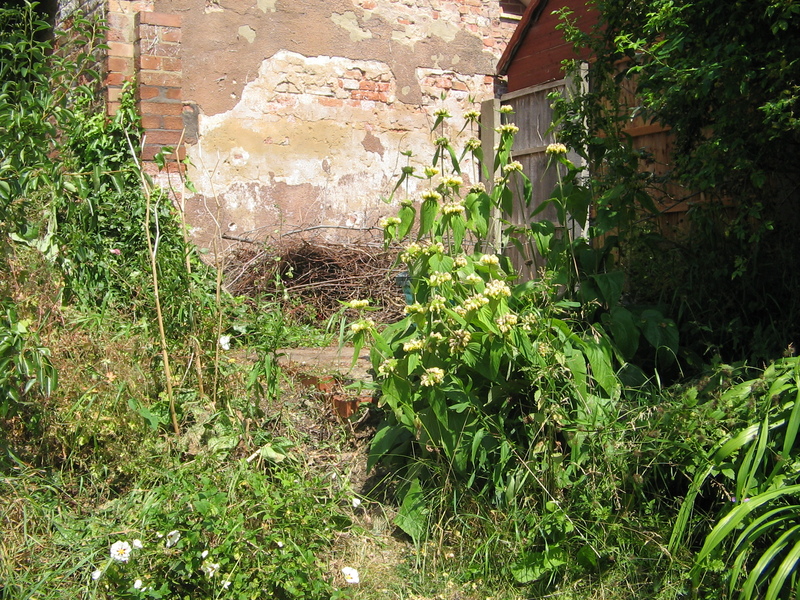 At the moment I am moving weeds and debris from one area to the other weedy area! 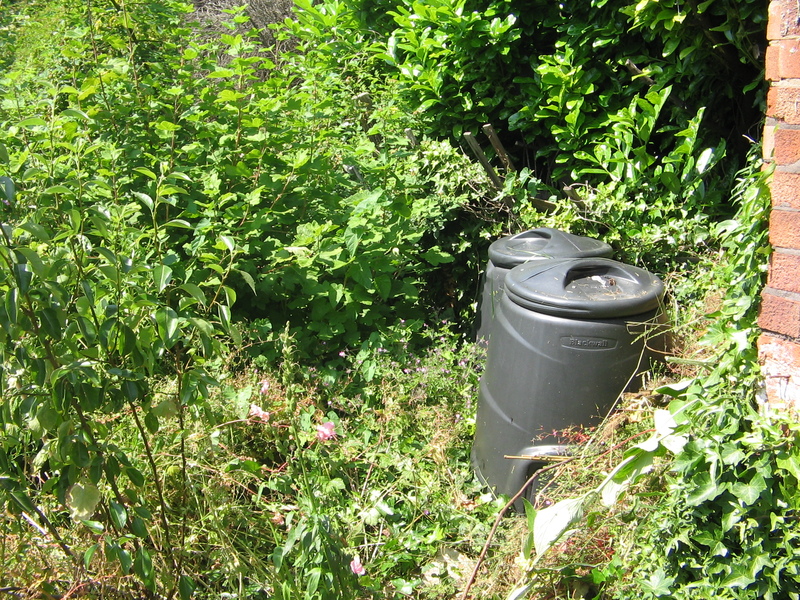 I found some composters hidden in the weeds! 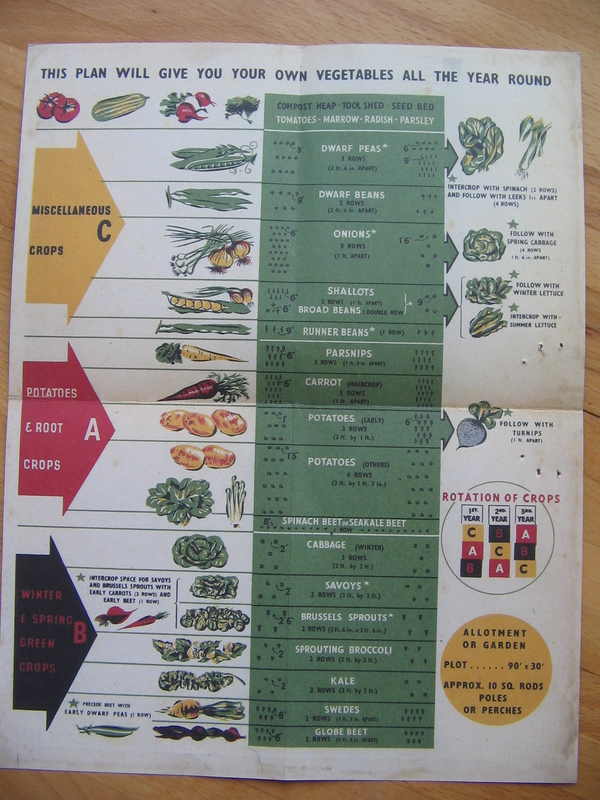 Am looking forward to doing some research on common vegetables grown in back gardens on the home front. 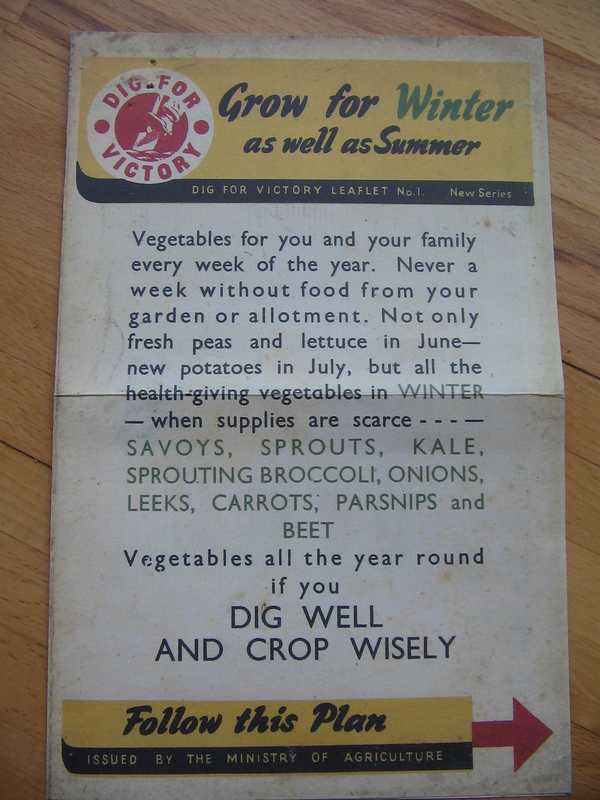 I do have an old leaflet on growing your own during the “Digging for Victory” campaign… thought you might like to see it. Click the images below to see full size images! This entry was posted in Uncategorized and tagged dig for victory, ministry of food, victory garden. Bookmark the permalink. What a perfect spot for a perfect garden! Don’t forget composting. You can really increase your yield with a simple composting system given all the vegetables you’re eating! Good luck! I love the booklet! It makes gardening easy for anyone to do. Can’t wait to see your progress! Julia is right. . .composting would be a great idea and a lovely way to dispose of all that greenery you just cleared out of your new veggie patch. You’re doing a great job! Can’t wait to see what it all looks like when you’re finished. Where do you get all your booklets and things? 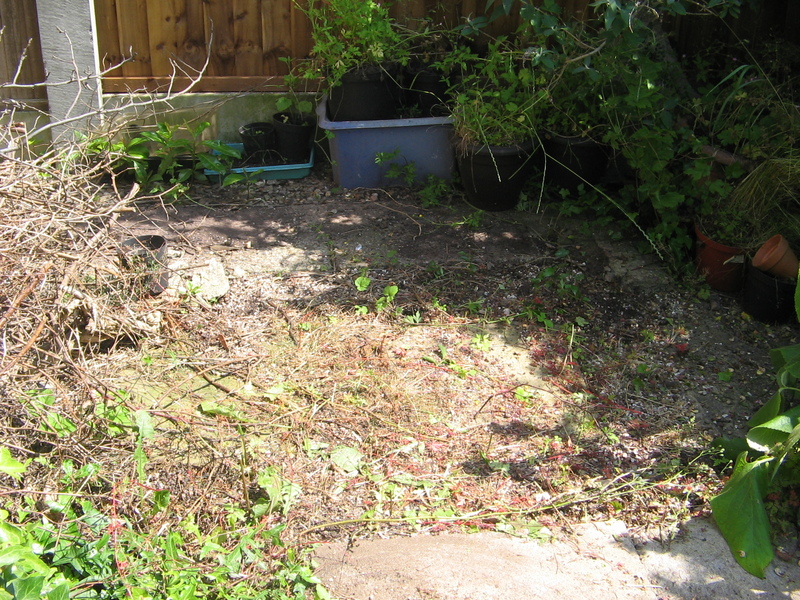 Seems the Universe is providing…….how lovely to have uncovered a patio area and composters……just what you needed. Funny how that sometimes happens! Thank you for the recipes . Good to see you settling in. 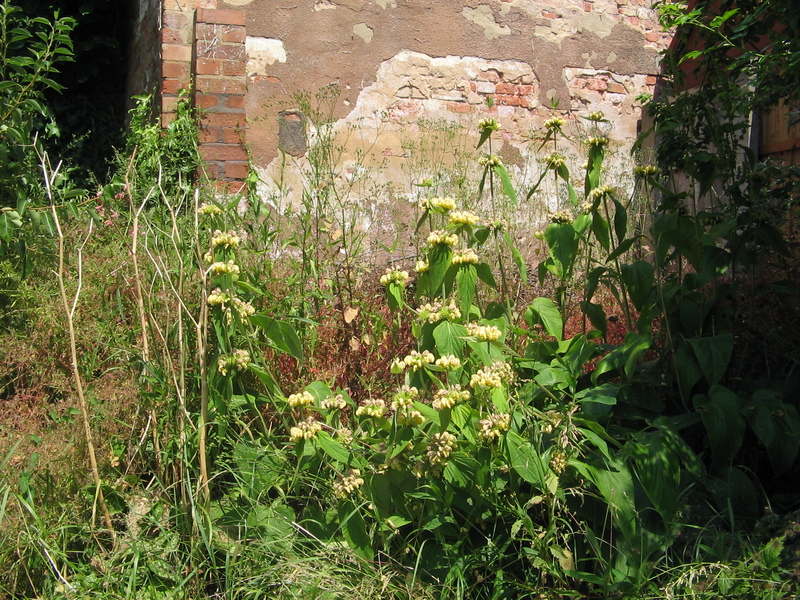 Ooh I’d love a new garden to get stuck into, prefereably an overgrown one like yours. All that clearing looks lots of fun. I don’t know how much you’ll manage to grow this year but I hope you’ll still have the house next spring when your August sowings come up. Good luck with it. I’m glad you’re enjoying yourself. I would love to have one of those pamphlets. Are they available to buy? That leaflet is amazing. And it looks like you will have lots of lush veggies all year round too! How are you settling in? I don’t know if you’ve had time to set up telly and internet yet, but did you know the BBC are repeating the first two series of Land Girls this week and next? I just found out yesterday. Series 1 episodes 1-4 are on i-Player with the fifth on at 1.45 BBC one today and series 2 Monday to Friday next week. No mention of series 3, although I would be suprised if they didn’t repeat that too. Caolyn, fantastic to see you settling in back in UK. The house is truly amazing, the sneak peek pics you posted previously before moving didn’t do it justice clearly! I hope it is helping you to adjust back into some normality after such an emotional period. The leaflets you show are also in book form, I have purchased books from amazon on dig for victory etc… and the same leaflets you posted are contained within those publications. They have been a great help to me and wonderful source of inspiration. I’m looking forward to more recipes and seeing everyone get back onto the straight and narrow with our rationing regime. It hasn’t been the same without your regular updates and contributions. Thanks Carolyn and KC, I had looked into Amazon but didn’t know which one’s to buy.